It’s a given. January is THE time for a sunny, fun-filled respite from the cruel indignity of a Chicago winter. But how far south does one go to capture toasty weather, fun, history mixed with a dab of culture and, of course, unabashed luxury? Key West – nah! Chile or Andalusia? Nada. 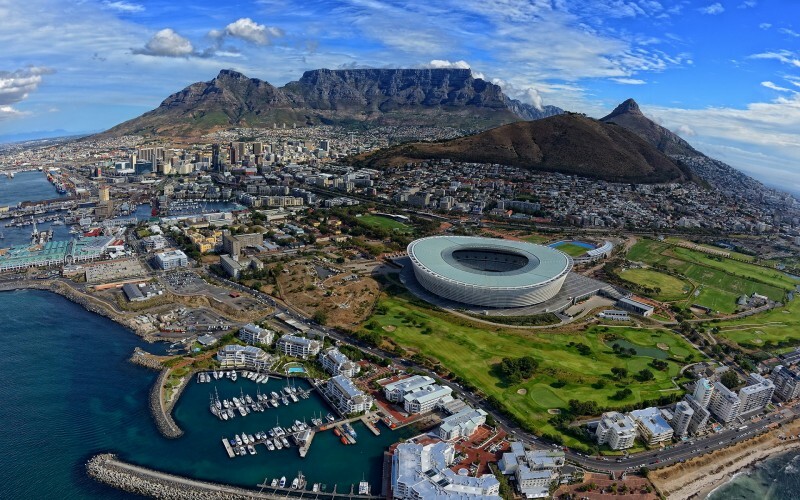 Try Cape Town, the southernmost city on the African continent. It was an auction item that, because of my friends’ encouragement (ok – call it peer pressure) I was the lucky winner of at last Spring’s Steve and Marjorie Harvey Foundation’s Annual Gala. Between getting to the airport(s), going through security, checking your bags, and flying on multiple planes for hours and hours – once you finally arrive I would recommend that you spend a day or two relaxing at one of the sun-drenched Clifton Beaches followed by a late lunch at The Bungalow – a spot that’s beautiful, bronzed and just a bit blasphemous. It is truly trendy and seriously chic. It reminded me of Villa Vera in Acapulco in the 80’s. The auction item included an 8,000 sq. ft. Presidential Suite at the Pepperclub Hotel – with a private rooftop pool we shared with some friends we dragged along. 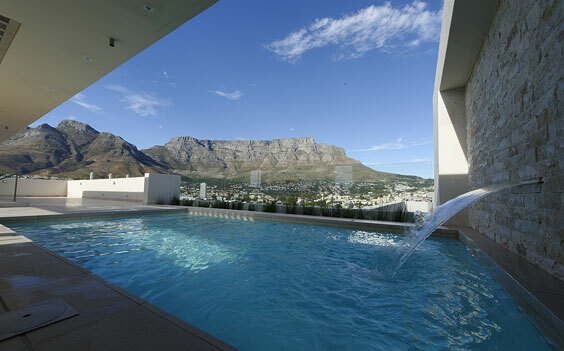 It is situated in the heart of bustling Cape Town, at the foot of renowned Table Mountain and Lions Head. The hotel not only offers the ideal location, but also five star comfort and personalized service to suit the needs of both leisure and business travelers. Inspired by the United States chic urban interiors, the hotel consists of 210 generously appointed suites, all of which include spectacular views. 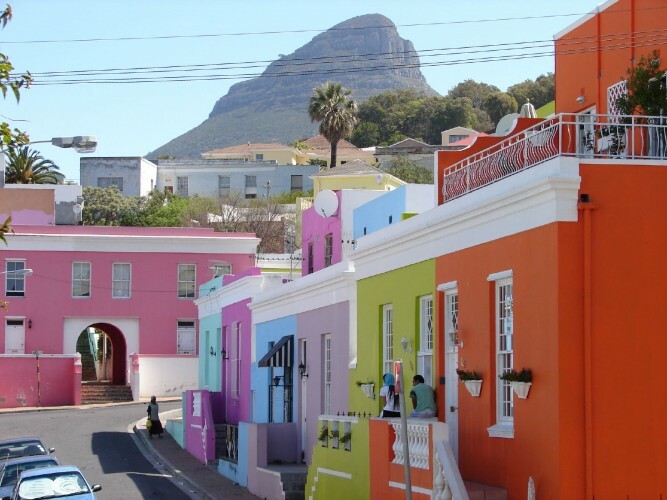 In a day tour of the “Mother City,’’ you can visit the Houses of Parliament, Greenmarket Square, the Company Gardens and iconic Table Mountain, with time left over to explore the cobblestone streets and brightly colored houses of Bo-Kapp, home of the Cape Malay community settled in 1652. The streets are lively, the people are friendly, and they have electricity ALL OF THE TIME. Having been to Nigeria many times, I have become accustomed to brown outs – a common occurrence in Lagos. Dining by candlelight is not for romance but rather a necessity. And getting stuck in elevators is the norm. That is not the case in Cape Town. 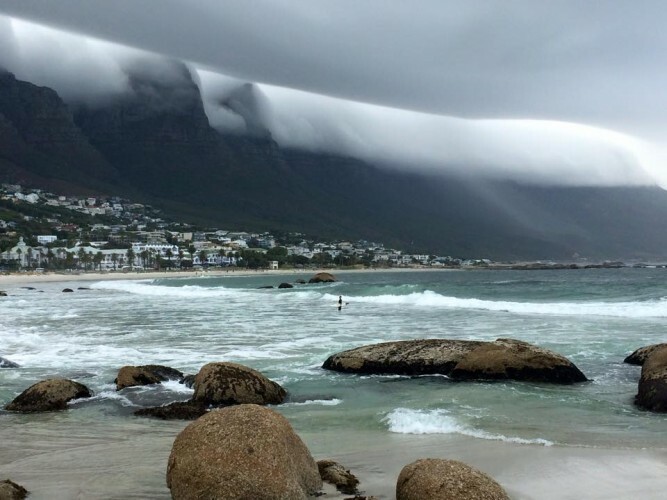 Clouds appear to drape over the top of Table Mountain, providing astonishing views from all angles. Surfers and sharks play in the water. For fun, you can actually dive into the Atlantic in an underground cage to watch sharks circle you and yes, you have to pay for that. But, honestly – we were surprised at how reasonable the prices are in South Africa. The US dollar is really strong there. How strong is the US Dollar in Cape Town? Well, take a look at this beautiful 5,920 square foot home. It offers an open floor plan, four bedrooms and stunning mountain views with rolling wine farms in the distance. It has a two story entrance with beams and thatched ceiling. 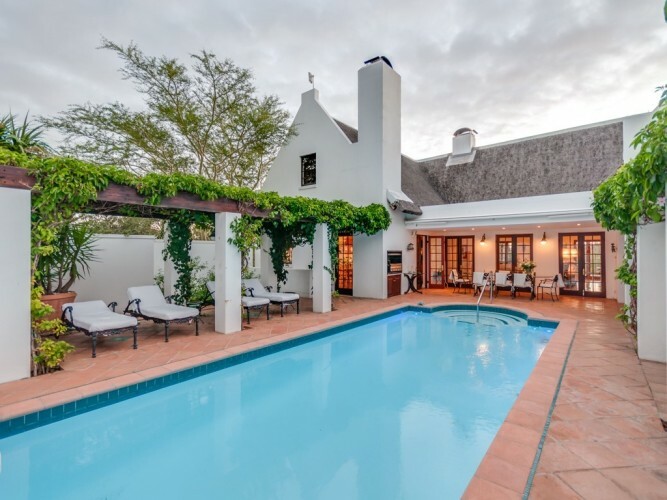 A high ceiling and double wooden doors open onto a private covered terrace overlooking the swimming pool where you will also find a sauna in which to relax. There are three terraces in total. The interior floors are heated. A wooden staircase leads to a loft area. All bedrooms have their own private bathrooms and lush garden views through large, beautiful windows. The lower level includes a spacious guest bedroom, en-suite, together with a flat, its own garden and small swimming pool. And, the price is less than $750,000.00 US. Unfortunately for JRWD, it doesn’t need to have any work done to it! A highlight of the trip was a private excursion to the wine country – a mere 35 minutes from the heart of Cape Town. One vineyard is more picturesque than the next with beautifully manicured gardens and elegant restaurants. 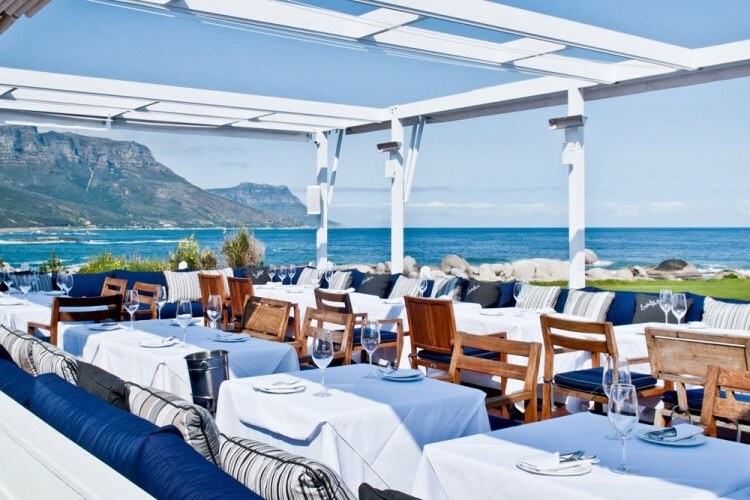 We enjoyed an extraordinary luncheon at the Delaire Graff Estate in Stellenbosch where Indochine offers an exquisite menu in an over-the-top setting – it is perfection! 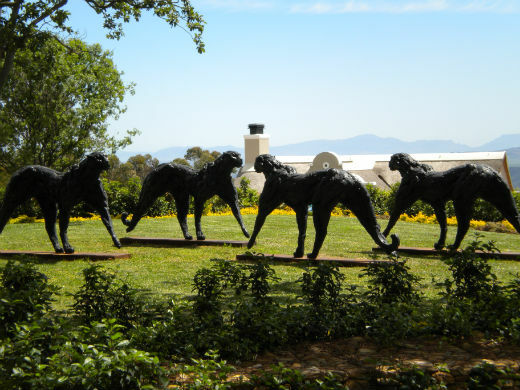 The property also includes an incredible contemporary art collection featuring pieces hand-selected by the owner. 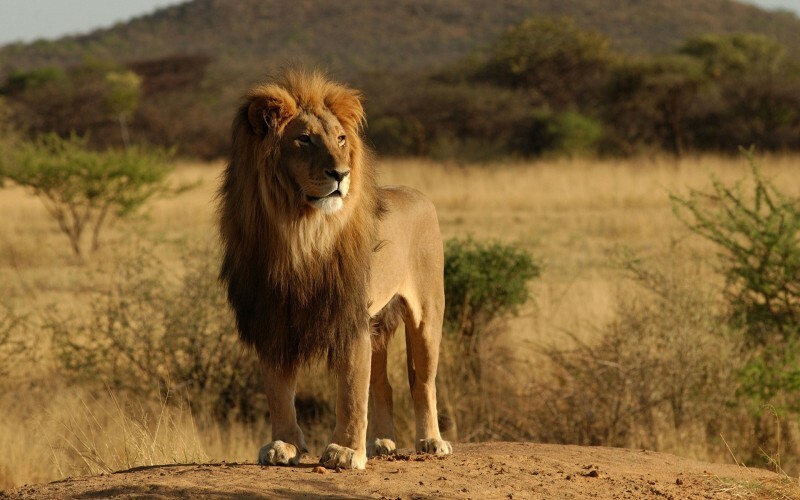 And for those who want to go on a breathtaking (malaria free) safari there are a number of reserves, some with beautiful accommodations, where you can see rhino, leopards, elephants, giraffes and the rare white lion. One of these reserves is just an hour or so out of town though it is like traveling to another planet. There is so much to do in and around Cape Town. Use it as your home base and explore. The city. The wine country. The reserves. Boulder Beach with its African Penguins. And, the point where the Indian and the Atlantic oceans meet. You’ll want to stay for two weeks and return to share the experience with your friends and family. If you have any interest call me for more information and “may your world be beautiful”! WoW and OMG what a wonderful trip that was and I’m so glad you were able to have this experience. Thanks for including me in your newsletters. John, Thank you for sharing your amazing trip. Perhaps one day my husband and I will go there too. Have a great and successful year. Thank you for sharing, your vacation looked and sounded absolutely fabulous. I will share this with Georgianne and put it on our list of places to visit. Thanks I sent it on to a friend. Bet the gala was fab. I was there 21 years ago, too long. How much is the trip? Wowzy wow wow!! LOVE LOVE LOVE and “may your world be beautiful”…. Love you!! Wonderful pics! Thanks for the update on your amazing life! Miss you. Cape Town is one of my favorite places in the world. I would love to spend every winter there. They have the most outstanding outdoor Shakespearean theater. I had the opportunity of seeing King Lear. Check it out I know you would enjoy it. Thank you so much for sending this. I hope you enjoy the rest of your trip. It sounds like a WONDERFUL trip … made even more special by your avoiding some of the Chicago’s often brutal Winter! And I’m so glad that after all these many years I’ve known you, you remain so joyous about new discoveries, appreciative of all things beautiful and slowed down by absolutely nothing!! Fabulous! Glad you enjoyed this trip. I love hearing about your travels. Thanks for sharing your stories & pictures. Thanks for sharing, John. I can dream travel vicariously through you. What a journey!!!! What amazing photos! Sounds like you had a great trip. I so wish I could have joined and revisited a truly magical city. I’ve been in the throws of grad school and am almost finished (August!) and have recently accepted a new job offer – big things in the big Apple! Hope all is well with JRWD and the crew in Chicago. So beautiful! A friend of mine is pilot and was just there this week. She was one the the people that paid to be in an underwater cage while sharks swam around her! Lol. Thx so much for sharing your Cape Town travel log. My husband and I are in Joberg now and will be spending four days in Cape Town in a couple of weeks. Loved reading about your experiences and seeing the beautiful pix. Always enjoy your emails. Plz keep sharing. Thank you for this. I loved reading this; looks like an amazing trip. Enjoy the rest of your day and enjoy your weekend.